After breakfast we walked to the train station and took the train to the airport. 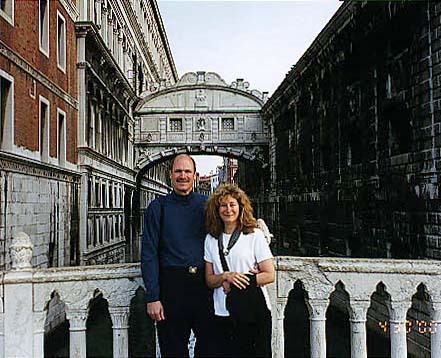 At 1:30 we caught our plane to Venice (Venezia), it took 1 1/2 hours to get there and they were on the same time zone. 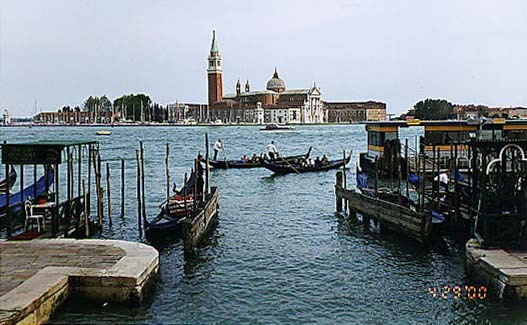 Once there we took out some Lire from the bank machine ($1 = about 2,100 lire) at the airport and took the waterbus to the Arsenale stop (17,000 lire, about 45 min. 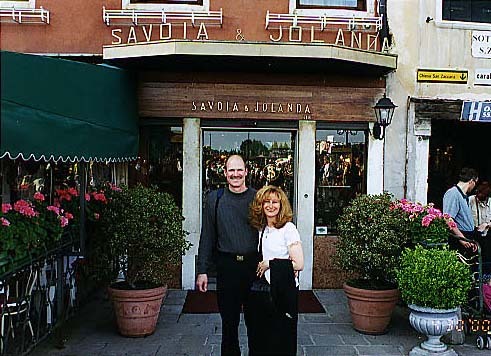 ), which was close to our hotel, the Savoia & Jolanda ( www.elmoro.com/savoia&jolanda ). 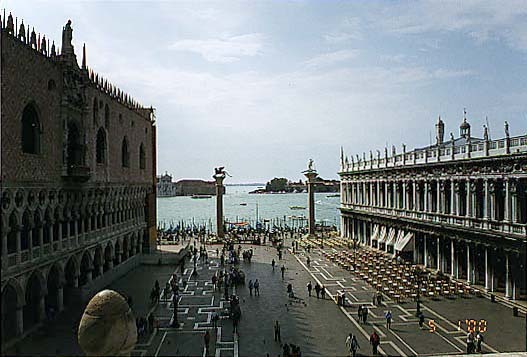 The hotel cost about $190 per night, but had a great location on the water and only five buildings away from St. Mark's Square, breakfast was also included in the price. We stayed in room 319 and had an angled view of the water and rooftops. After walking around the area we decided to have dinner at our hotel the first night, we both had pasta dishes, split a salad and 1/2 a liter of wine (59,000 lira minus 25% discount for hotel guest). Sunday, April 30, We woke up at 6:00 am and started walking around at about 7 am. It was great to be able to walk around without the square or walks being crowded. We went back to the hotel and had the best buffet breakfast that I have had in Europe (eggs, bacon, cereal, fruit, yogart, crossant, juices, etc.). We then went on a private tour of a Malano glass factory via the hotel. 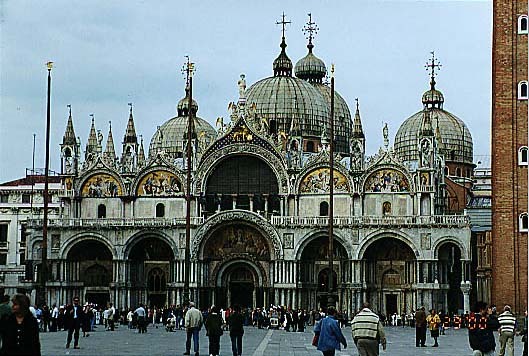 After we bought two Actv three day shuttle passes for 70,000 lire and boated back to our San Marco area. The shuttle is boats that go from place to place about every 15 minutes ( www.actv.it/inglese/home.htm ). We then walked to the Jewish ghetto and Lynn bought some souveniers. Back for a rest at the hotel and off to the Riato bridge and to Tratoria all a Madonna for dinner and met a nice couple from Switzerland. 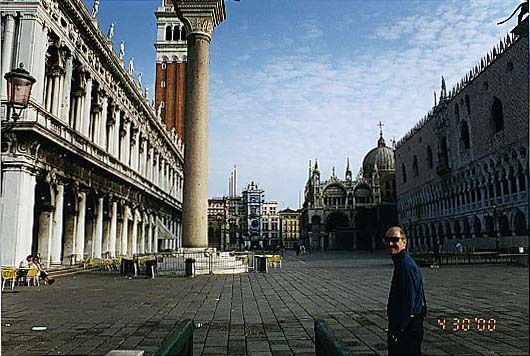 Monday, May 1, 2000, Up early again and strolled around before the crowds and breakfast. After breakfast we stood in line and went inside the Bascillica San Marco and went upstairs for a grand view of the St. Marks Square (3 lire). We were glad we went early because the line grew longer and longer. After, we went window shopping and back by the Rialto bridge. We then took a 40 min. 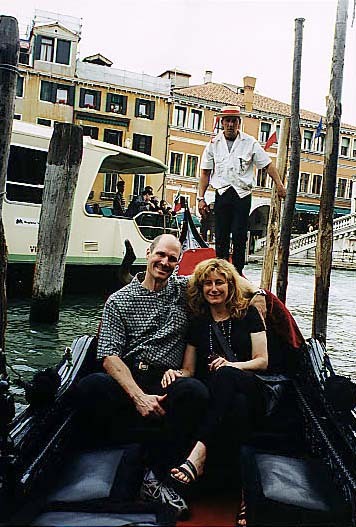 gondola ride which was very relaxing and scenic (150,000 lire). As we got off the gondola, it rained for about 10 minutes. We then stopped for pizza and beer at an outdoor cafe. We then got on the #1 Vaporetto (shuttle) and had a scenic ride to Lido stop and then back to our hotel. After freshening up we went out to try some recommended restaurants but they were closed due to May day, so we ate something light at a pricey cafe and went back by our hotel for desert before going in to repack our suitcases. They were a little tighter from our souveniers, hats, shirt for me and sandels for Lynn. 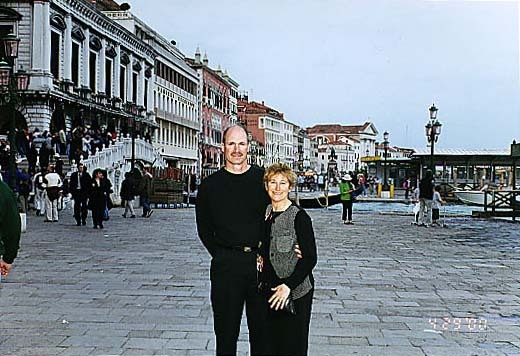 Tuesday, Up early for a walk, breakfast and then took the #1 vaporetto through Venice and to the train station. While waiting in the train station we saw three different gypsys go through with children asking for hand outs. 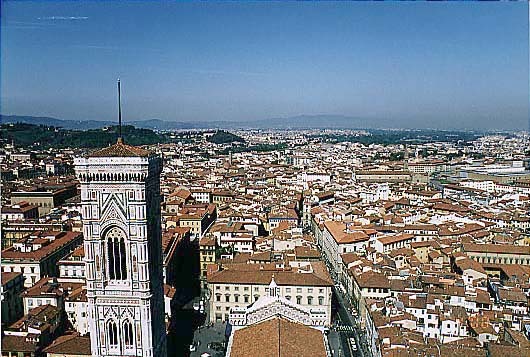 We had first class seats on the train that left at 12:30 and arrived in Florence (Firenze) about 3:30. Once off we found our way to the Hotel Casci (Tel. 055 211686), a small hotel on the 3rd floor, about a 10 min. walk and checked in to room 18. The hotel was nothing to write home about, but the owners were very nice and the rooms were clean. The cost was about $100 per night and breakfast was again included, no eggs here. 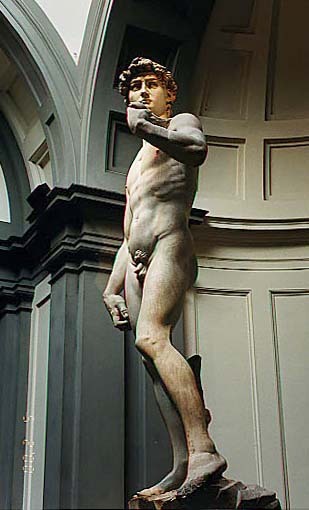 After we cleaned up we headed out to explore and went to see Michelangelo's David (1504) at the Accademia. 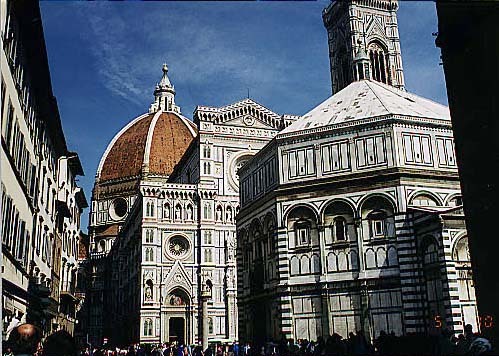 After going through the Accademia, a small place, we walked past the Duomo (the baptistery (11th century), the dome of the cathedral (1434), the facade of the cathedral are covered in different colored marble) on our way to Ponte Vecchio. We went to dinner at Mamma Gina's, ( www.mega.it/mamma.gina/ , Tel. 055 2396009) the menu was in italian, but an english speaking waiter helped us and the food was so good we had to go back to the same place the next night. Wednesday, May 3rd, After breakfast we walked to the Ponte Vecchio area and took pictures of statues and fountains near the Uffizi. There were long lines to get in the Uffizi, but luckily Lynn had made us reservations for later that day (To make reservations). We were going to take the enjoy Florence walking tour but no one showed up so we went to the Boboli Gardens. It was a huge estate that had great views of the area. 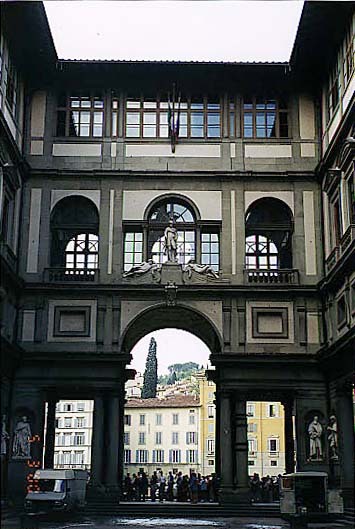 We then went back to the Uffizi and we were able to walk right up and get our tickets and get in. We saw works by Boticcelli, Michaelangelo, Leonardo Da Vinci. There was a lot of religious art and many statues and paintings and we were tired by 1:30, so we went back to our room for a rest before we went out to Mamma Gina's (120,000 lire). Dinner at Momma Gina's then walked back to our hotel. 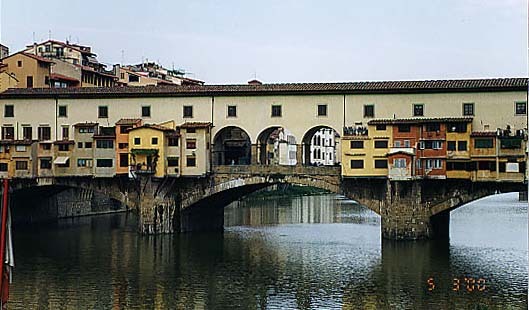 Thursday, last day in Florence. After breakfast we checked our email at a free service in the hotel lobby then checked out of our room, left our bags and went out for some last minute sight seeing. We started by climbing 463(?) steps to the top of the Duomo of the Church of Santa Maria. The views were great and we took many pictures. 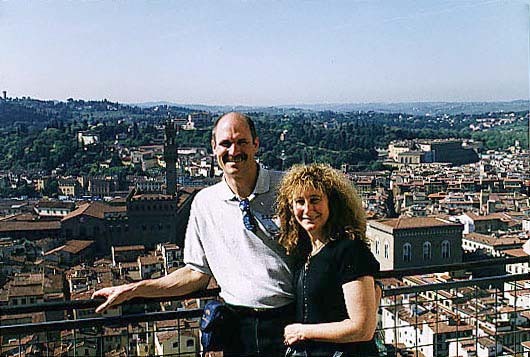 We bought two belts and then stopped at the Bargello, a museum with statues (Donatello's David, Michaelangelo's Bacchus, etc), before we ate lunch at a Chinese restaurant. Then back to the hotel for our bags and off to the train station and a wait until about 3:30 for the train. 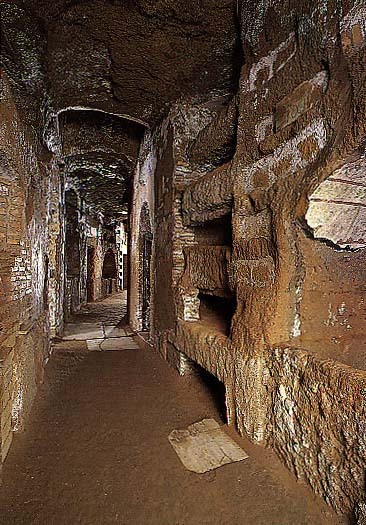 We passed through many tunnels and vineyards before arriving in Rome about 5:00. We took a taxi (15 lire) to our hotel Santa Chiara ( www.italyhotel.com/roma/santa_chiara/ , about $190/night, breakfast included, Tel (06) 6872979), about on block from the Pantheon. 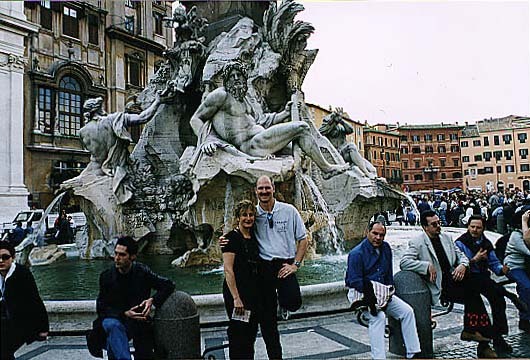 We dropped of our bags in room 226 and ventured out, past the Pantheon, the Palazza Madama (the Senators house, which had guards with machine guns), then on to Piazza Navona with it's beautiful fountain symbolizing four rivers (Danube, Nile, Ganges & Rio de la Plata). 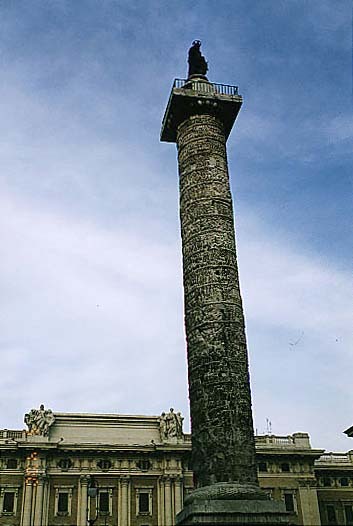 Then we went to the Trevi Fountain via the Parliment building and past an obolisque honoring Caesar Augustus, and past a spiraling tower with scupture all the way around it. 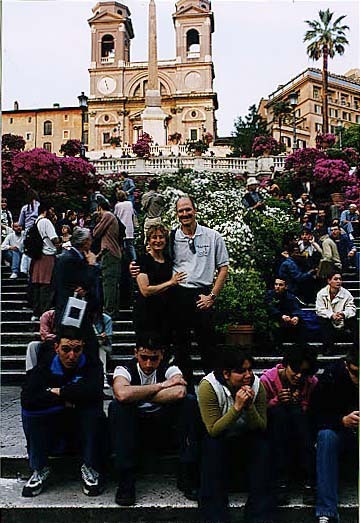 We then kept walking and went to the Spanish Steps with a mass of people, flowers and plants. We then stopped for dinner at a restaurant called Piccola Roma. It was a good dinner (salmon and mushroom fettuchines, lamb and steak with potatoes, the service was a little slow but we enjoyed ourselves (102 lire). We had wine with about every dinner. We noticed that even people dinning alone would usually have a liter of wine by themselves. Then back to our hotel, it was a nice room, no airconditioning turned on yet and a noisey street besides us, but it didn't keep us awake. Friday, May 5th, after breakfast we took a cab to the Vatican Museums. As we got there the line had just opened up and we only had about a 10 min. wait to get in (18 lire). 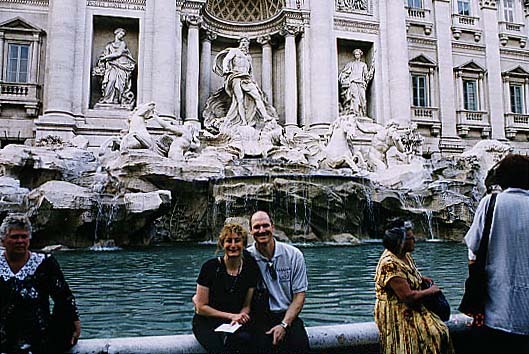 Once in we went directly the Sistine Chapel to view Michaelangelo's ceiling painting. Then we went thru the other areas, and Lynn really enjoyed the Raphael rooms. We went on to St. Peters massive church and then to the Jewish Ghetto and toured the synagogue. 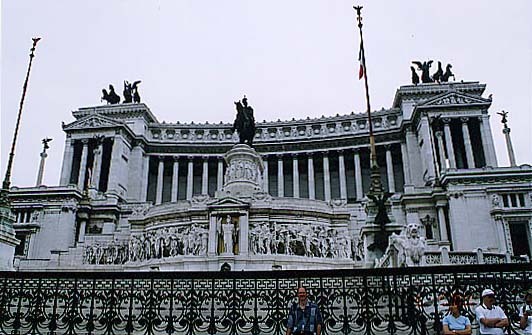 From there we went past the Piazza Venezia (National War Memorial) on our way to the Colliseum. Took a cab back to the hotel for a nap and then out walking past a obelisque with an elephant base in front of a church at the end of our street. Went in and it was much larger than it appeared outside. 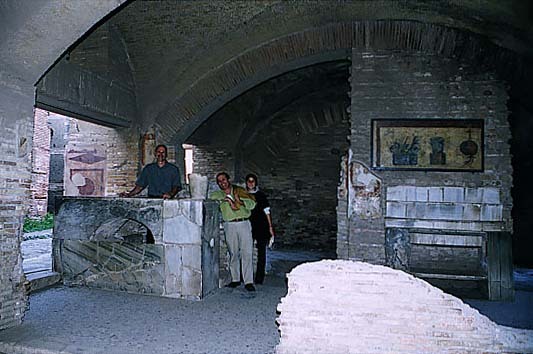 It had the tomb of St. Catherine of Siena and a sculpture by Michaelangelo inside. We stopped at a pizzeria La Maddalena, for pasta and pizza and then went to Giolitti for ice cream before heading in for the night. 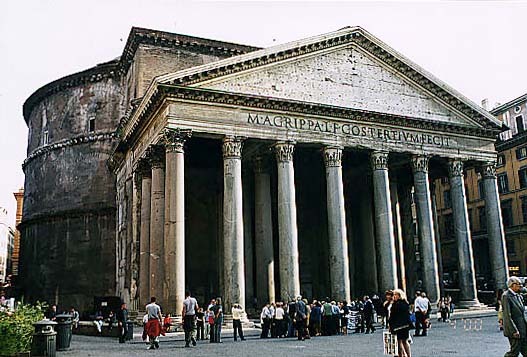 Saturday, We woke up at 6:00 and after breakfast, checked out and were picked up by Alfredo Peparini ( cpeparini@pelagus.it , 06-66.562.663) for a personalized tour. Alfredo use to be with NBC when they had a office in Rome but since they don't anymore, he does Limousine Services and can give tours or book stays. 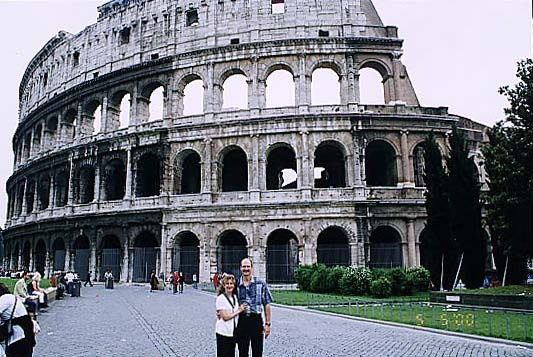 He took us around Rome, told us of the history and we viewed Julius Caesars Palace (Imperial Palace), went past the American Embassy, past Sofia Loren's rooftop flat and on to one of the Catacombs, where about 500,000 romans were buried underground. We then saw the Domini Quo Vadis Church where Christ footprint is. Alfredo explained that the bee symbol that was on many public works was the crest of the Barbarini family that gave much financial support to projects. 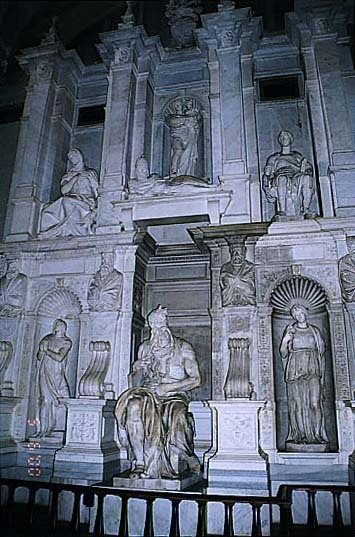 We then went to the Church of St. Peters in Chains and viewed Michaelangelo's sculpture of Moses, where a pope is buried above. Drove to the Order of the Knights of Malta to look thru the keyhole at the view of St. Peter's Basillica thru and archway of trees. Then to Alfredo's house where we met his son David, wife Katia, daughter Alex and dogs Apricot and Bayou. 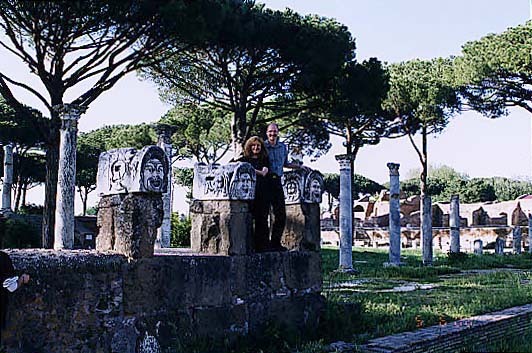 We had a wonderful large lunch before going out to tour Ostia Antica, a Roman City ruins from 550 BC. 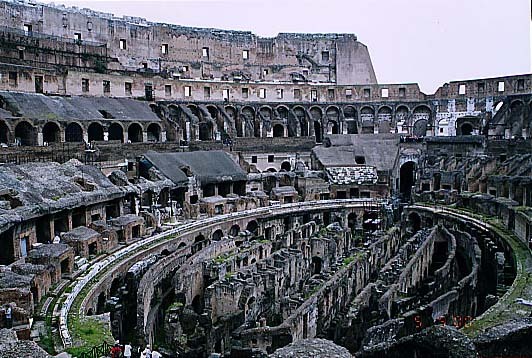 It was a total community with baths, gymnasium, merchants shops, homes, pegan temples, theatre and restaurants. Alex provided the guided information and Alfredo the language interpretation. Lastly we drove through the new area of Ostia and along the beach of the Mediterranean Sea street before going back for dinner and calling it a night. Sunday, May 7th. Last day in Italy, we had breakfast with Alfredo and he dropped us off at the airport about 9 am for our 11:00 non-stop flight from Rome to Detroit. Our flight was due into Detroit at 3 pm but a few hours short of Detroit the pilot came on the intercom to tell us that they had smelled smoke at the rear of the plane and we were going to make an emergency landing in Halifax, Nova Scotia (the nearest land) in about 15 minutes. He also warned us that there would be firetrucks meeting us as a precation. Needless to say our blood-presure rose a few notches as we waited to get to land. Once landed at the Halifax airport and boarded by firemen, they decided to pull us to the terminal, unfortunately the plane must have been to large for their equipment and broke the connection. So the pilot had to start the engines back up and taxi us to the terminal. Once inside we had to clear customs and then started to wait for another plane that came from Minneapolis to take us to Detroit. We ended up learning a new card game called golf from another couple (Paul & Deb from Minnesota) while we waited until the plane boarded us and we left at 1:30 in the morning. Back in Detroit at 4:00 am and home by 5:00 am. Northwest did do a good job of updating us as to the status and did buy us dinner and gave us all free tickets for a roundtrip ticket anywhere in the continental US. So, we need to start planing our next trip, stay tuned. Want to rent a Condo in Key Largo?